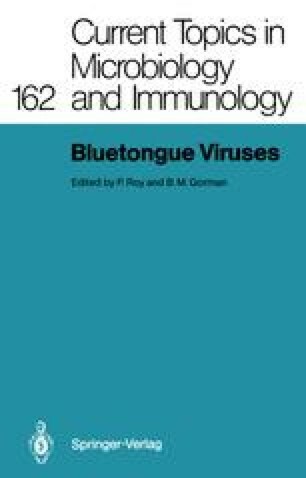 Bluetongue virus (BTV) replicates in the cytoplasm of a wide variety of cell types and infection ultimately leads to cell death. The studies of Verwoerd, Huismans and others in the late 1960s and continuing to the present (see Chap. 2, this volume) on the double-stranded, segmented genomic RNA (Verwoerd 1969; Verwoerd et al. 1970), the bishelled nature of the virus particle (Verwoerd et al. 1972), the activation of the virion-bound transcriptase, and the activity of this enzyme in vivo and in vitro (Verwoerd and Huismans 1972) indicated that BTV possesses many characteristics in common with reovirus. However, BTV and the similar African horse-sickness and epizootic hemorrhagic disease (EHD) of deer viruses differ from reovirus in several respects. They are smaller, lack a well-defined outer capsid layer, and exhibit greater pH sensitivity. In addition, they are insect transmitted. Such differences led to the grouping of these viruses (Verwoerd 1970) into a genus for which the name “orbivirus” was proposed (Borden et al. 1971). BTV is the type species of the Orbivirus genus within the Reoviridae family.